Have you seen my Cute & Comfy Bubble Romper, refashioned from a T-shirt and a woman’s top?It was published on Brassy Apple in June… Go on reading, and you’ll see it! … but wait! There’s a Craftsy huge deal… for you! Did you know that Craftsy (affiliate link) isn’t only patterns and classes? And that today and tomorrow there’s a Huge Sale going on RIGHT NOW, with savings up to 70%? Offer: Craftsy’s Whale of a Flash Sale! Don’t miss out on Craftsy’s Whale of a Flash Sale (affiliate link)! Just 48 hours to enjoy up to 70% off fabric, yarn & kits before they sell out. Click quick to save! Hurry, offer expires August 22nd at 11:59pm MT. Shop Craftsy (affiliate link)‘s Whale of a Flash Sale! … now, for the romper refashion! Lately they’ve opened a “shop” near here, where you can’t buy/sell anything: you can only swap one piece of clothing with one other: it’s my personal Heaven! When I knew I was going to write a post about refashion for Megan, I suddenly thought: “I have nothing to wear refashion” like if it was a first date… and it is, somehow! can I have a Bubble Romper for me, please?! one or two Tops/T-shirts/dresses… anything you want to refashion – seek for jersey! Step 1: measure your model (or yourself)! This will be the only pattern piece you need, corresponding to front, back AND legs, all together. 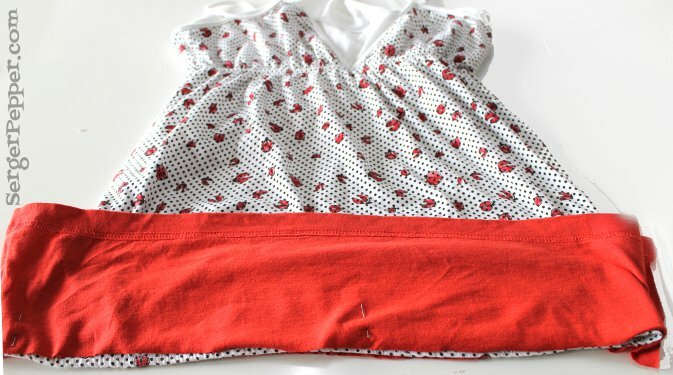 If you have a T-shirt with these measurements and you’d like to make a uni romper, you can cut out this shape and simply close it in circle with a side seam, right sides facing, then go to Step 4.
c. My ladybug top was perfect in width but too short! 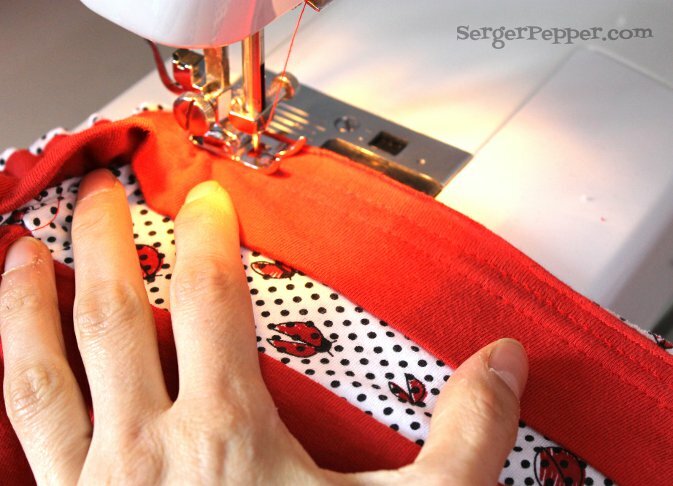 – a simple sewing machine is good, also if a serger is better! – use an elastic stitch: my favorite are triple straight stitch, triple zig-zag and three-step zig-zag (but a plain zig-zag will absolutely do the trick). 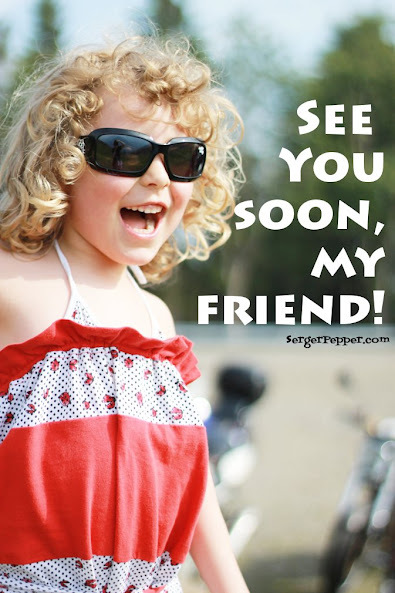 Ok, I’m done, I can put away my schoolmistress’ glasses! Step 3: Add stripes, please! In this particular romper, I planned my colorblock so that I could use the red hem as the romper hem, sewing it to the ladybird bottom. 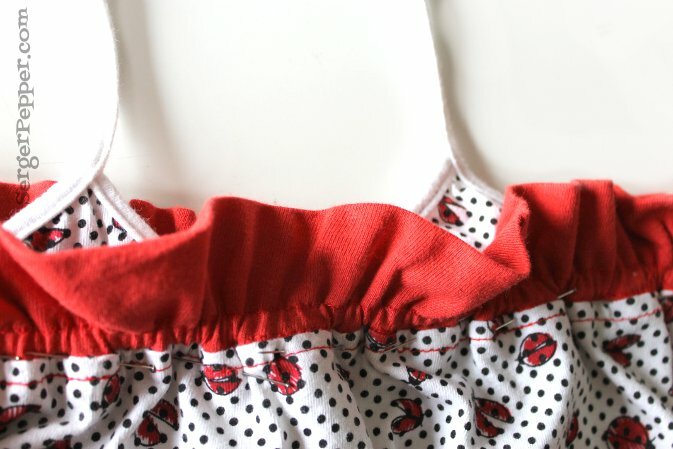 With ladybug top right side out, slip the red ring of fabric onto the outside of the top, match up the only side seam you have in the strip to one of the side seams of the ladybug top, aligning raw edges; pin here and there. 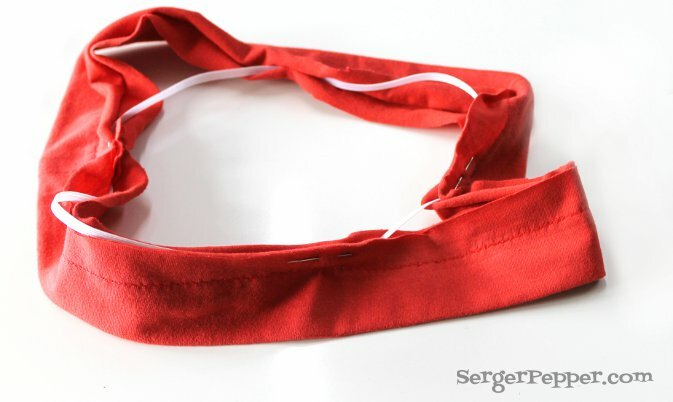 If you have a serger, directly serge with a four-threads stitch, if you don’t have it, sew with a triple straight stitch (oprional: trim and zig-zag edges). Here’s the result: it looks nice! Why not keeping it like this? Uh, certainly, we want a romper… let’s go on, then! 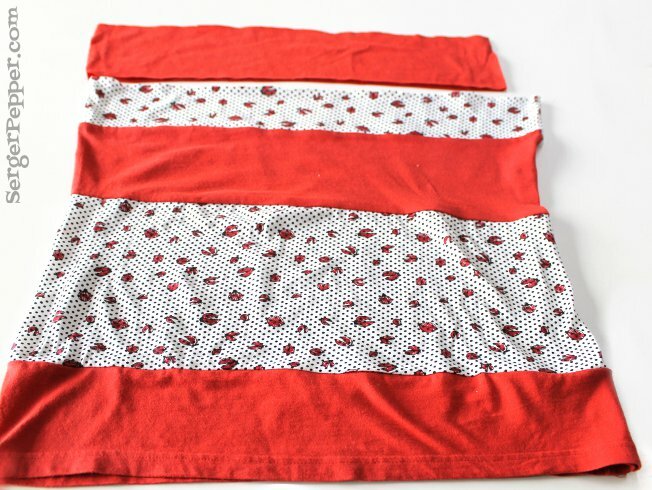 Go on adding strips, alternating the ladybug and the red fabric, until you reach the measured chest to seat (your rectangular pattern piece’s height). 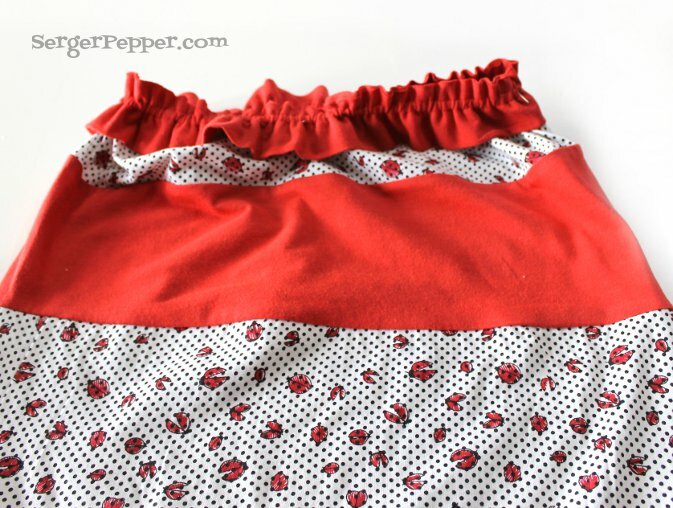 We’re going to do something fancier with that last red strip: ruffles! Disclaimer: This is the only tricky part… follow me and I promise it won’t be as bad as it seems! Close it in circle, as you did for each stripe in step 3. Fold in half lengthwise, wrong sides together, and press to crease. Sew one row of straight stitches 1″ from the fold, parallel to it, all around the ring of fabric. Cut a length of your 1/4″ flat elastic, equal to your model’s chest girth. Secure heads together sewing back and forth multiple times (do not twist the elastic!). Insert the elastic in the casing you’re creating, put 4 pins to keep it in place, at cardinal points. 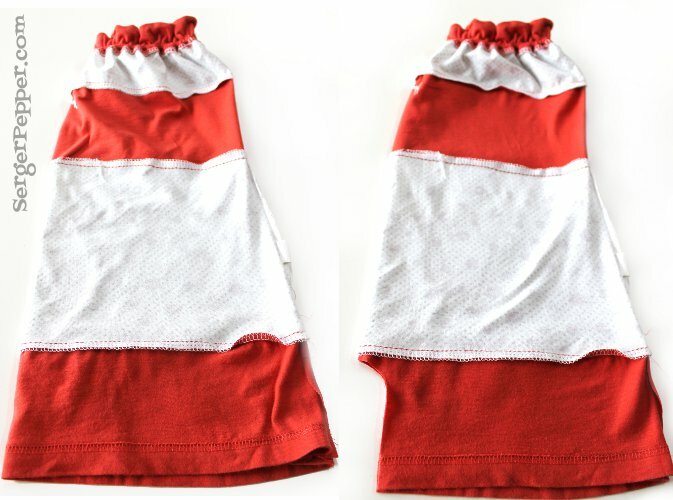 While stretching the elastic and keeping it out of the needle’s way, sew a second row of straight stitches to encase it and create ruffles. 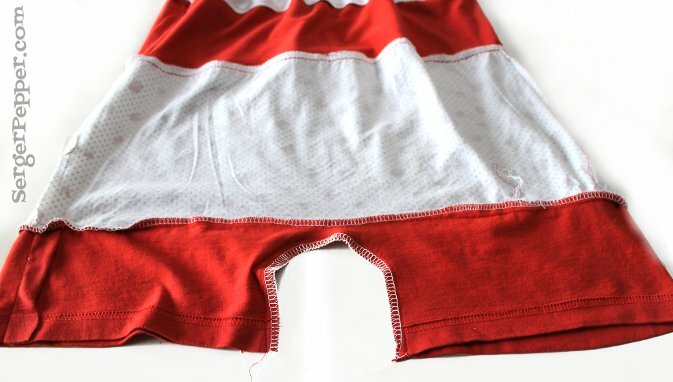 Turn inside out your romper, fold in half along the center and cut the crotch like in the picture. Height of the cut is equal to leg’s length you chose while taking measurements. Sew one row of stitches all around (better use an elastic stitch, this is a stress point!) and finish edges with zig zag or serger. 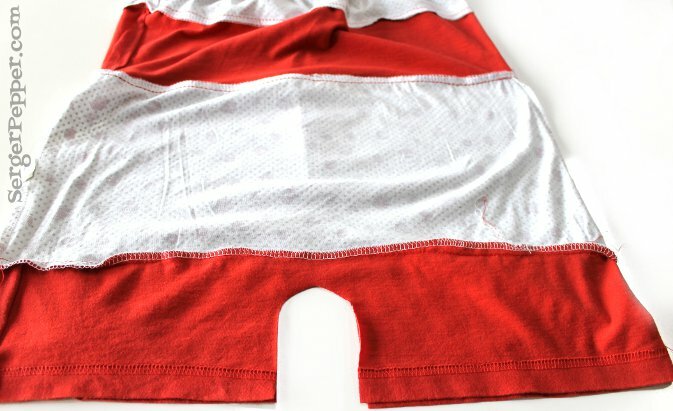 using your favorite elastic stitch (here I would choose a three-step zig-zag), stitch in place the elastic, to the wrong side of the original T-shirt’s hem, stretching it while sewing. Use a red thead in the cone and a white one in the bobbin… almost invisible on both sides! Step 6: Optional touch: add a bra! 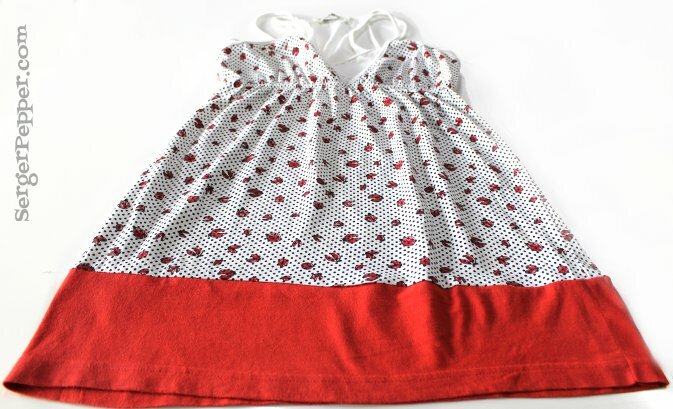 If you like (my little fashionista does), wear it with a super simple skinny belt, or made one with leftovers. 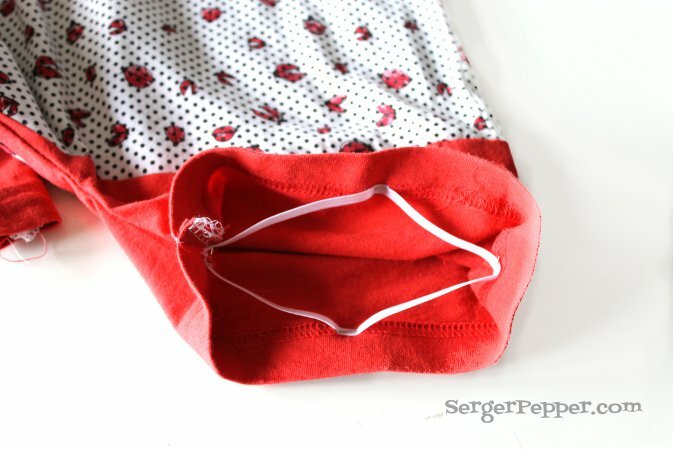 I hope you enjoyed my Refashion Tutorial, if you’d like to have more, come to SergerPepper.com… there’s always something new! PS: Pardon the ramblings… I get passionate when it comes to talking about sewing!